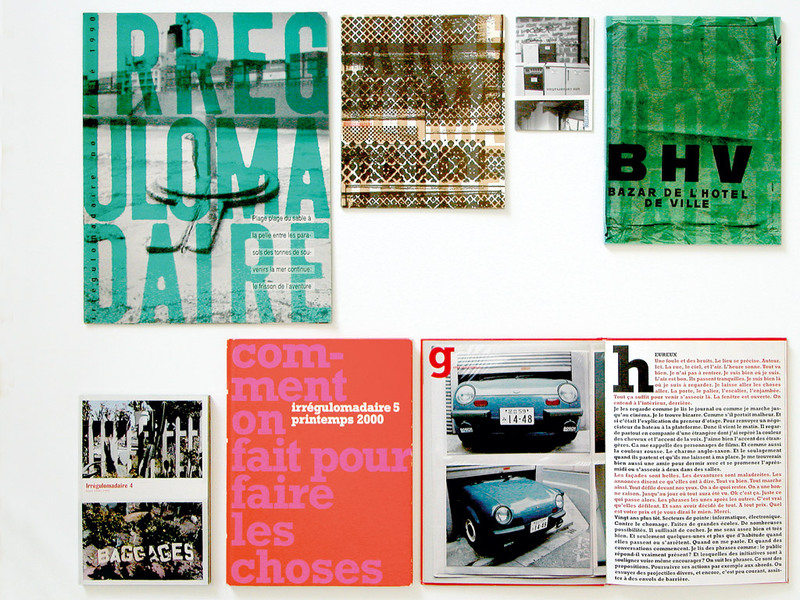 Irrégulomadaire was founded by Jean-Charles Depaule, Susanna Shannon, and myself in 1990 as an experimental collaborative publishing project. As the title suggests, Irrégulomadaire does not come out on a fixed time schedule, nor does it have a fixed format or content. Each issue has a different theme and employs a different editorial process or strategy for exploring it. 16 pages, 2 color offset, 37 x 29.5 cm [14 5/8 x 11 5/8 in. ], unbound. Irrégulomadaire 2, “Les rues du Caire...,” Summer 1991. 48 pages, 2 color offset, 23 x 20 cm [9 x 7 7/8 in. ], softbound. Irrégulomadaire Hors-série, “Une conversation/ Conversation Pieces,” 1992. 3 color offset + rubber stamps, 13.5 x 9.5 cm [5 3/8 x 3 3/4 in. ], saddle stitched, in an envelope. Irrégulomadaire 3, “Ssbhv (drama),” 1993. This issue is about the hardware department located in the basement of Bazar de l'Hôtel de ville, a major department store in Paris. 3 color offset, 27 x 21 cm [10 5/8 x 8 1/4 in. ], softbound. 196 pages, color and black and white offset, 22.5 x 15.5 cm [8 7/8 x 6 1/8 in. ], softbound. Irrégulomadaire 5, “Comment on fait pour faire les choses,” 2000. Includes many contributions presented in alphabetical order. 68 pages, 4-color process offset, 28.5 x 21.5 cm [11 1/4 x 8 1/2 in. ], hardbound.